This is the head in the aft cabin. In general, heads on a boat are not very interesting. They are somewhat sterile ... no wood ... generally white and very plain. The heads on Sister are not an exception. Perhaps the first mate can change that. Most sailboat heads require that the user operate a hand pump to remove the contents and pump in some fresh (salt) water after use. Typically one does one's business, stands up, turns around, bends over and operates the hand pump. Most unenjoyable, particularly if you're already a bit seasick. Sister's heads, on the other hand are electric. More complicated and more likely to fail at some point but well worth the risk. Note the separate shower stall. While not uncommon, separate shower stalls are probably still the exception rather than the norm. Often, if a boat has a shower it is in the main part of the head. Everything in the head gets soaked, not just the showerer. A separate shower stall is very nice. 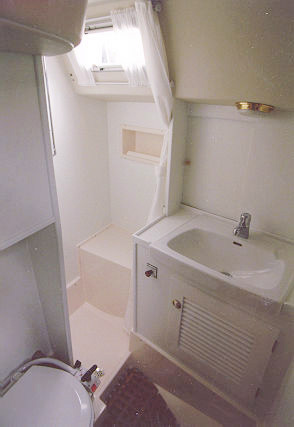 Both heads on board Sister have electric heads and separate shower stalls.